Why are they protesting in Rome? April 12 saw violence break out in the capital of Italy as protesters responded to new reforms proposed by current Prime Minister Matteo Renzi that would create significant reductions to public sector spending. 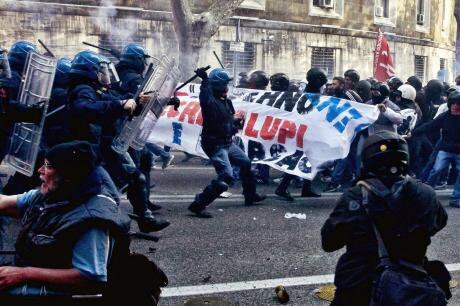 Protests in Rome against Renzi's economic reforms turn violent. Demotix/Stefano Montessi. Some rights reserved. April 12 saw violence break out in the capital of Italy as protesters responded to new reforms proposed by current Prime Minister Matteo Renzi that would create significant reductions to public sector spending. Russia Today reported that clashes between demonstrators and the police resulted in around 80 injured citizens on both sides, including one protester that lost several fingers from a prematurely exploded firecracker. The protesters - a combination of workers, students and activists - gathered at Rome’s Porta Pia and marched throughout the city, chanting in unison and waving Italian flags. The crowd convened in order to demand that the government introduce economic reforms, provide access to affordable housing, and reduce the current unemployment rate, which stands at 13% as of February. Many of the attendees donned Autonome-styled black outfits, hoodies, and Guy Fawkes masks, a common symbol of the Occupy movement, and marched until reaching the Ministry of Industry where the protest became violent. The incident was the most recent of demonstrations since December 2013, in which supporters of the Forconi (Pitchfork) Movement assembled to protest Enrico Letta’s economic reforms which imposed further austerity, rising living expenses and taxes, and corruption within the Italian government and European banking system. Demonstrators blocked railway passages and governmental buildings in Venice, Bari, Milan, Turin and Palermo, and cities became embroiled in clashes between police and activists. Italy has seen, in recent months, a surge in protest and secession movements that have threatened the country from several positions, and Renzi, as Prime Minister, has inherited a host of problems from both the former Berlusconi administration and the global financial crisis. In a foreboding February 28 article from the Independent, the author illustrates the mayor’s sentiments. “Without the stop gap injection of €500m (£406m), Mr. Marino predicted chaos would ensue. ‘In March there won’t be money to pay 25,000 city employees, to pay for fuel for the buses, to keep the nurseries open, to collect rubbish or to organise the canonisation of the two popes, an event of a planetary scale,’ he [Marino] said.” Mayor Marino’s fears were realized with the outbreak of riots last Saturday. A Reuters article details Renzi’s economic reforms, which were outlined in his Economic and Financial Document (DEF) and included a rescue package of 6.7 billion euros funded by 4.5 billion in public sector cuts, higher VAT taxes, and “indirect” taxes on banks. “His DEF, approved Tuesday by cabinet, includes plans for annual income-tax cuts of 10 billion euros targeting low earners, a cap on the salaries of top public-sector managers and higher capital-gains tax for banks,” Gazetta del Sud reports. Renzi’s new economic policies have come under extreme criticism from colleagues and opposition parties for further impoverishing the middle and lower classes, and exacerbating current austerity measures already in place from institutions such as the European Central Bank and International Monetary Fund. Democratic Party (Partido Democratico) member and former junior economy minister Stefano Fassina complained that the DEF did nothing to change the current economic problems of Italy and would result in "less growth, fewer jobs and more public debt", Gavin Jones of Reuters reports.